A privet hedge running along a property border is a classic look. The very name seems to say "privacy," as if a line of these bushes could form the ideal screen for those seeking a more private setting. 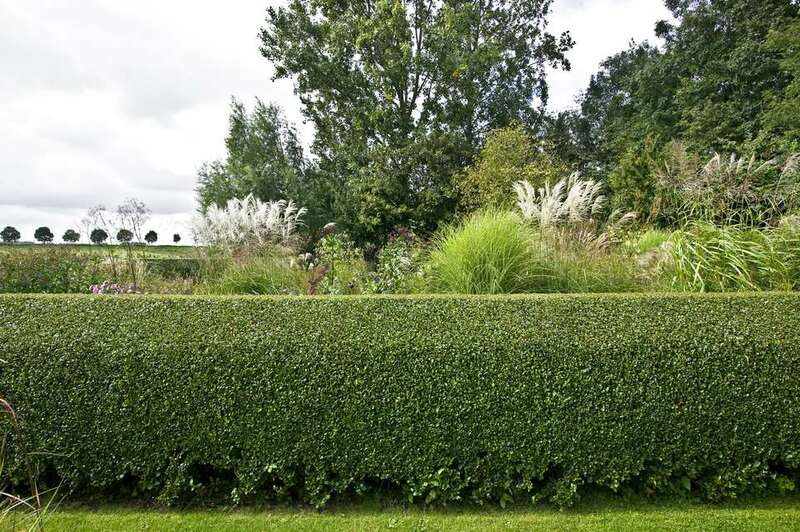 Many kinds are not especially beautiful plants when considered in isolation, but they do excel in the role of hedges. Privet grows more quickly and can be shaped more easily than can boxwood shrubs, for instance. The dense foliage is not evergreen in many climates, making it best suited for summertime-only privacy hedges. The flowers attract bees and butterflies, while some have leaves that turn lovely colors in the fall before they drop. The privet shrubs cold-hardy enough to be grown in the north are used almost exclusively to form hedges or topiaries. Privet hedges tolerate heavy pruning. They do not seem to be troubled by the pollution in urban settings, plus they are salt-tolerant plants, making them a good choice for a hedge along a street. To plant a new hedge, position the plants about a foot apart in a trench 2 feet wide and 2 feet deep, and mound the soil around the stems. Some varieties of privet shrubs, which are indigenous to the Old World, are considered invasive plants in parts of North America. Check to ensure whether or not the kind you want to use is appropriate for your area. Privet varieties like either full sun or part sun, and will grow best when they get more sun. A good amount of sun also brings out the color best for gold and variegated varieties. Privet is tolerant of a variety of soil types, as well as different levels of acidity and alkalinity, so long as it drains well. When you are planting a hedge, be sure to note any changes in soil type or condition, which will affect the uniformity of the hedge. Amend the soil if there are any areas of poor soil. They are salt-tolerant plants, which is an important consideration if they will be near a street that gets salted in the winter. Water your privet hedges weekly. You may need to water more frequently in high heat. Drip irrigation is a good choice, especially for new hedges. Once established, they are noted to be drought tolerant. Depending on plant variety and the zone in which you live, privet hedges can be evergreen, semi-evergreen, or deciduous. Not being evergreen in the north, privet hedges will be attractive for only a portion of the year there; for the same reason, they cannot furnish privacy year-round. California privet (L. ovalifolium): Hardy in zones 5 to 8, it grows 10 to 15 feet high and wide. Golden privet (L. ovalifolium Aureum): Hardy in zones 5 to 8, it grows 8 to 10 feet high and wide. Golden Vicary (L. x vicaryi): Hardy in zones 5 to 7, it grows 6 to 12 feet tall, with a spread of 7 to 10 feet. Border privet (L. obtusifolium): Hardy in zones 3 to 7, it grows 10 to 12 feet tall, with a spread of 12 to 15 feet. Amur privet (L. amurense): Hardy in zones 3 to 6, it grows 12 to 15 feet tall, with a spread of 8 to 15 feet. Japanese or "wax" privet (L. japonicum): Hardy in zones 7 to 10, it grows 6 to 12 feet tall, with a spread of 6 to 8 feet and has fragrant flowers. "Texanum" is a popular cultivar. Variegated leaves marked by gray-green mottling and cream-silver edges may be seen in the cultivars "Jack Frost," "Silver Star." and "Variegatum." Chinese privet (L. sinense): Hardy in zones 7 to 9, it grows 10 to 12 feet tall. Shear these bushes after they have flowered; thereafter, shear them an additional three or four times during the course of the summer. Privet hedges will become bushier and fill in better if they are pruned correctly and frequently. Privet is a poisonous plant. The leaves and berries contain glycosides that can cause abdominal pain, nausea, and vomiting. This can affect humans, cats, dogs, and horses. As the plant produces small black berries, caution children not to eat them.